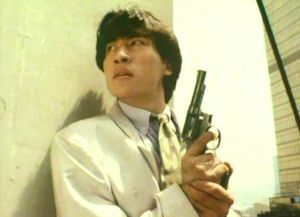 The Skinny: Your usual Yuen Woo-Ping action is the selling point for this entertaining action flick. The characters aren't very interesting, but it's doubtful that anybody who checks this out will care. And besides, it has Michael Wong. Cheung Kwok-Leung is James, a Hong Kong cop who gets into some serious crap. He and partner John (Michael Wong!) are investigating big business guy Mr. Lee (Wong Kam-Kong), who's suspected of your usual corporate chicanery. To that end, they employ James' girlfriend Suki (Cheung Man), who's an up-and-coming businesswoman. They discover that Mr. Lee is, in fact, dirty, but unfortunately their score is undone by Lee's corrupt ties to the government. Even worse, somebody on the cops tries to extort ten million US dollars from Mr. Lee, leading to a kidnapping, some bullets and a large explosion which turns James into "The Phantom of the Police Station." He becomes disfigured and hides from his former life. Meanwhile, John has been disgraced for supposedly being the extortionist, and Suki has become Mr. Lee's employee/arm candy. When all the players get back together six months later, new questions arise. Did John actually extort Mr. Lee? Is Suki really as emotionally wounded and good-hearted as James believes her to be? And will James' scarred-face make-up fall off mid-take? Just like Tiger Cage 2, Tiger Cage 3 has nothing to do with the original Tiger Cage. All the three films have in common are cops, white collar corruption, and an overriding desire to make sure the audience goes home feeling like complete and utter crap. There's some enjoyably-staged violence here, but those seeking warm and fuzzy movie experiences had best check themselves at the door. Yuen Woo-Ping serves up the usual assortment of acrobatic gunplay, leaping martial arts and - the Tiger Cage trademark - exceptionally painful looking impact. With that final factor in mind, Tiger Cage 3 ends up being fun early-nineties HK entertainment, provided you turn the multiplex desire for happy endings AND likable characters off. Of all the characters in the film, only James seems somewhat righteous and likable. Everyone else (even Cheung Man) either seems or is shady, which doesn't make for much audience identification. Furthermore, the characters aren't exactly deep, and the situations far from exceptionally interesting. As narrative filmmaking goes, Tiger Cage 3 is only average. But who cares? This movie features people fighting and dying in an entertaining fashion. And, as everybody knows, lots of HK Cinema fans love films that feature people fighting and dying in an entertaining fashion. While not as dark and tough-minded as the first film, nor as kung-fu happy as the second, this third Tiger Cage is still better than your usual mindless action flick. (Kozo 2003). image courtesy of Ocean Shores Video Co., Ltd.